1.Vegetables are best fresh - raw, in salads, or roasted. 2. Ubiquitous mason jars; not only useful, but also beautiful. 3. How wonderful it is to be married to my best friend. 4. 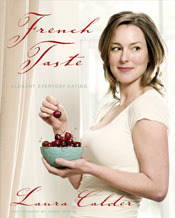 Laura Calder's French Taste is a book I'd love to recommend. Easy recipes with flair. 5. Using leftovers: I like making soup - here it's pureed squash, with pumpkin seeds on top. 6. 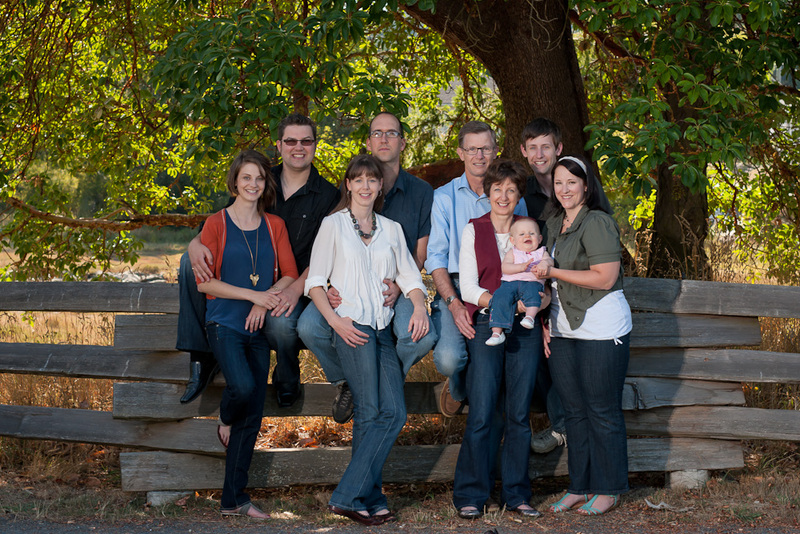 My family makes me incredibly happy! 7. And as for the weekend, tonight I'm looking forward to going out for dinner with my husband, tomorrow my plans include gardening and more gardening and Sunday, I want to go to church, relax, watch my granddaughter for the afternoon, take a walk, and in the evening we'll watch "Monarch of the Glen." Have a great weekend - and I'm hoping for sunshine! Great post, great pix, great plans! Great photos to go with your post! I have no weekend plans. I should change that. This post is so well crafted. I love everything about it and most especially the family photo, though the one of you and your hubby is very sweet, too. Love your 'friday fill-ins'. Pumpkin seeds on squash soup...great idea. Great photo of your lovely family. We are off to see the local production of 'Fiddler on the Roof' tonight. On Sunday we are invited for 'faspa' to my uncle and aunt's...who are also your uncle and aunt (sort of). Have a great weekend. What wonderful photos of you and your husband and your family! It sounds like a wonderful weekend is ahead. I have dinner out with my husband and another couple tonight, visiting a nephew to see his new baby girl this weekend and church and relazation on Sunday. The wonderful things, simple but profound, that bring joy and contentment to our lives! Sounds like a wonderful weekend. Have fun! After the appealing food photos, I certainly plan to spend a little time in the kitchen! What a lovely collection of Friday Fill in's Lorrie. the back to back photo is terrific and it's nice to see your family gathered together. Family is so important! To start our weekend, I was able to spend time in the sunshine reading a book. Then the wind came up ... back inside again. Haven't heard of Monarch of the Glen, but I bet if you like it, I will, too. Tag sales tomorrow - always a fun way to spend a Saturday morning. Your posts are always so lovely. Have a wonderful weekend. I'm heading to Vancouver to meet up with an artist friend for a Saturday of gallery hopping. Sounds like you're having a perfect weekend!!! LOVE this post and it's telling a lot about YOU! What a gorgeous family you have - isn't that everything?! I'll see if our library has Laura Calder's book - it sounds so good. We should be staying home this weekend and getting out in the garden -- those dandelions! Instead we're getting ready to go see Aida here in Vancouver. . .
You have a lovely-looking family and you all seem so happy in each other's company. What a great and fun photo of you and hubby. Also a lovely family photo. You are blessed. I've just enjoyed scrolling through your posts. Can't believe how long I have not been here! Beautiful family photo! I love your photos!! So wonderful. I'm now wishing I had butternut squash soup. And I am off to search the library for that cookbook. Thanks. 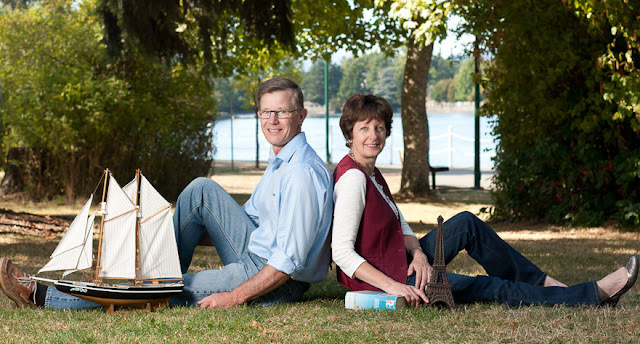 Hi Lorrie, I came here via Pondside and just wanted to say hello to a "neighbour"...I live on the Saanich Penninsula too. What a lovely family you have and those cherries...so luscious! Blessings.